Checklist questions are one of the more common survey question types, and they are also used heavily in data collection forms, which are a form of survey. And for good reason. You can get specific, actionable answers to a question – if the question is written correctly. A poorly designed survey checklist question can hide problems and confuse interpretation. 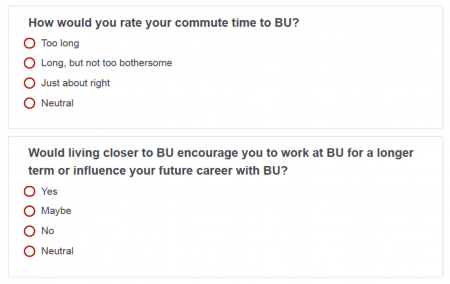 We’ll show a checklist question from the Wall Street Journal customer service group that is problematic in its design, along with a retention survey for employees at Boston University that likely made the findings meaningless. Most surveys of customers, employees or the like use what are called “checklist questions”. It’s a good name since it is what it says. We present a list of options to the respondent and ask which ones fit the respondent. They’re also known as multiple choice questions. What types of cars have you driven in the past? What types of cars are you considering for your next purchase? What features are important to you for your next car selection? We could pose these as open-ended questions, but then the poor analyst has to try to make sense of all the textual responses. Yuk! So, instead we present a list of options from which the respondent can select. Easier for the respondent and MUCH easier for the analyst. Checklist questions are heavily used in data collection forms where many of the questions will be demographic in nature. Provide clear and readily interpretable answers that can be translated into action plans. Was anything wrong with the shipment? Yes or No. What the type(s) of problems did you encounter? followed by a list of possible problems. We can calculate the frequency distribution of certain types of problems – solid data for an improvement project. 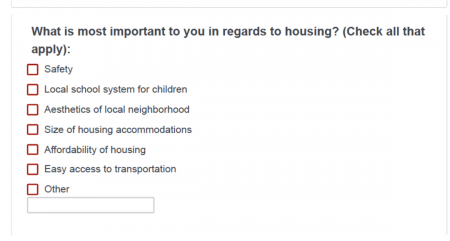 Every survey question type has some design considerations. The goal is to get valid, meaningful data, and these design standards help achieve that. Well designed questions also lower the likelihood of respondents skipping a question — an “item non response” — or abandoning the survey. The wording of checklist questions is generally pretty straightforward. The real challenge lies in the set of checklist options. Comprehensive list of options. The checklist should have a “home” for every respondent. That is, respondents should be able to find an option that fits their situation. Non-overlapping list of options. Comprehensiveness means we present many options, and there should be clear distinctions among the options. The respondent shouldn’t have to debate which of two options to select because they’re both saying nearly the same thing. Avoid fatigue. Comprehensiveness is good but not too much comprehensiveness. Too detailed a list means a long list that will lead to a “satisficing” effect – the respondent will choose the first good enough answer, not the optimal answer. “Other: Please specify.” Always include this option at the end. It captures the unexpected and gives us feedback on the quality of the checklist. So, you want a short, but comprehensive list. Seems contradictory, doesn’t it? Yes, you’re right. This is the art of survey question design. We have to deal with such trade-offs frequently in survey design. Another design consideration relates to the order of the checklist items. Primacy and recency effects – choosing the first or last option – are known to occur. If you put the most likely answer first, you’re creating a bias toward that answer. The best solution is to randomize the order, negating the order effects. However, Other always goes last. Received wrong newspaper. My delivery service also handles the New York Times, Worcester Telegram and the Boston Globe. Occasionally, I get those papers instead of the WSJ. How do I report that? I can’t. Paper delivered to wrong or different location on property. My paper is typically thrown onto the driveway. Makes sense. But occasionally, it’s thrown onto my lawn – or into bushes. I might not find it right away. Lawn delivery is fine in the summer, but what about winter when I could have 3 feet of snow on the ground? Do I want to trudge through the snow to get it? All of this feedback that should go back to the driver, the delivery company, and to WSJ. Today, it can’t. If WSJ had included an Other option, they might have learned what to add to the checklist. Do they not want to know? It’s not like they haven’t been told. I have made these comments known to WSJ customer service multiple times over the years, but to no avail. Nothing ever changed. However, I recently had such a bad experience with a poorly designed subscription renewal form that I reached out via LinkedIn to the VP of Customer Experience. I had a long, pleasant phone conversation with a senior manager; I think they are listening. I hope. Sadly, all this reinforces my doctoral research from decades ago that many (most) companies choke off feedback from customers via the customer service agents. Sad. A company’s products can be improved by doing something that’s apparently novel: listen to one’s customers. Actively. 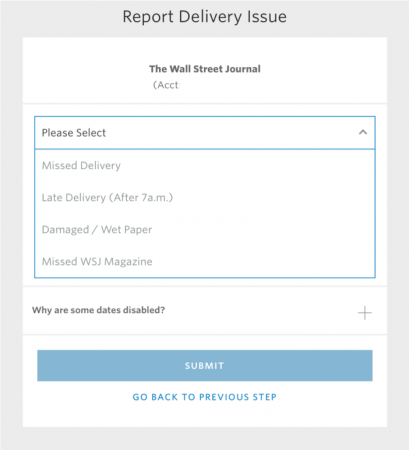 The lack of an Other text box in the WSJ data collection form wards off the customer service folks there from learning new types of issues their customers have. But the Other submissions have a downside: data cleansing. However, you will also find people writing in an answer that would seem to fit one of the categories you offered them. You will need to reclassify those into the appropriate bucket to get meaningful statistics. Now, you might be thinking, “If I didn’t offer the Other, the respondent would have chosen that option.” You might be correct, but you might also find that the way you worded that option led people to not choose it. Critically look at the wording in light of the Other submissions that talk to the same option. And learn what new options you need in your checklist. Most times I can figure out what the survey design meant to write. Here I can’t. Elsewhere I’ve written about ways to measure importance. Our third example above is a good example of how not to do it. The question states: “What is most important…?” But then the instructions say “Check all that apply.” Those are contradictory. Either have radio buttons and tell respondents to check the most important or have checkboxes and ask to check the two most important. If everything is important, nothing is important. Finally, look at the response options for these last pair of questions. What does Neutral mean here? Neutral means “in the middle” or “not strong feelings in either direction.” How does that differ from “Long, but not too bothersome” and “Maybe”? As the reader of the report, how would you interpret Neutral responses in the context of these questions? My guess is that many respondents chose Neutral when they “preferred not to answer”. Regardless, this survey question checklist option set garbles any idea for a course of action. Yes, you’d think that they’d tap the research professors to design the survey, but they certainly didn’t. At least, I hope they didn’t. How to word those checklist options. And we need to look at the textual responses from “Other; please specify” as the opportunity to learn from our respondents. Finally, a properly done pilot test before launch might have caught these mistakes. 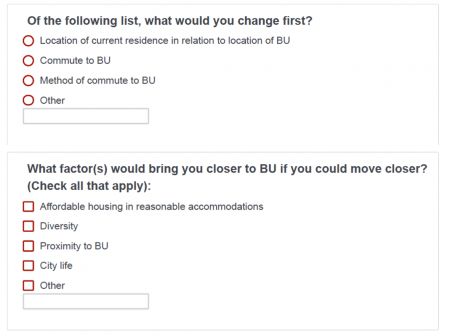 Why survey designers and form creators don’t think they make mistakes is beyond me. I wish I were that perfect.